​Are you unsure about whether to get the mini micro or iscoot whizz? 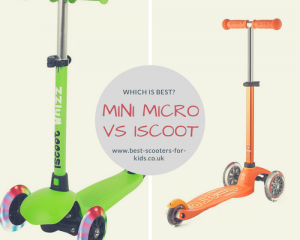 Well this article compares the two so you can see what you are getting for your money and which would be the best choice for your child.The two scooters featured in the article are the Mini Micro Deluxe version and the Iscoot whizz which are aimed at young children from aged 2 to 5 years old. The iscoot's handlebar height has 3 different height setting from 55cm to 69cmThe mini micro's ranges from 49cm to 69cm. And you can adjust it exactly to suit your child's height.This makes the mini micro slightly better for the very smallest and younger children and to make sure it has the perfect height. If you think about how you would feel riding a scooter, the handlebars would be comfortable around waist height. This is the same for your child. There is only 7cm difference in the lowest handlebar heights between the iScoot and the mini micro but obviously the lower option is going to be slightly better for children on the small side. Both scooters have wheels made out of PU which both look to be good quality. Polyurethane wheels better absorb bumps and cracks on the pavement than other materials such as plastic wheels. Therefore they tend to give a smoother ride. Both the scooters are designed with a lean and steer mechanism. So instead of using the handlebars to steer the scooter, you lean to the right to go right and the left to go left. Neither the iscoot whizz or mini micro scooter is foldable. Folding mechanisms add weight to scooter so to keep the scooters lightweight they don't have them. A lightweight scooter is better for young children as it makes it easier to control the scooter. However although the scooters aren't foldable, the handlebars can both be removed from the base so it can be easily stored or taken on holiday quite easily in the boot of the car if you wanted to. The mini micro is lighter than the iscoot. The iscoot weighs 2.4kg whereas the mini micro weighs 1.5kg so there is quite a big difference. This means that the micro is much easier to carry. It's also easier for younger kids to control and manoeuvre because its lighter. For example they will be able to pick it up to go up and down the kerb, over steps and more easily navigate it through doorways. It will be easy for them to move and handle too. The mini micro deluxe is also extremely lightweight for parents to carry when they have to. The mini micro does have some well designed features which shows it's extra quality. For example, it has a deck which is made of reinforces fibreglass meaning that It's super lightweight while being extra strong and will take weight of up to 35kg (5 stone and 7 pounds). However, is the extra cost of the mini micro worth these extra features? The iscoot is much cheaper than the micro. However, the micro could be sold second hand if you take good care of it or passed onto a sibling, friend or relative. The mini micros tend to have quite good resale values so you can recoup some of your money if it is kept in good condition. 2 year olds - The mini micro is an excellent choice for 2 year olds and younger, smaller children due to the minimum handlebar height being so low at 49cm. Lightweight option - Everything has been considered on this scooter to make it as lightweight as possible. This is because a lighter scooter is much easier for children in this age range to manage and control. Quality - Despite being lightweight every part of this scooter is also well designed and well made to withstand the play of a young child. For example, the deck is made of flexible fibreglass and has been reinforced. It's therefore brilliant at absorbing shocks from bumps from the pavement. A tight budget - the cost is much higher than the iscoot whizz which can be a big consideration. Are the extra features worth the extra price. The young child is very much in control using this scooter. They can use it to go slowly when they are unsure but when they are ready to go a bit faster, the polyurethane wheels will give a fast and smooth ride. It's easy for them to zip along but just as easy to use the brake at the back to slow down where necessary. Those on a budget. This is an excellent scooter at this price point with some great features for younger children. 3 year olds - if you're buying for a 3 year old, then you may not need the lowest height settings on the mini micro and the handlebar height may be fine for their size. Also, older, heavier kids can manage heavier scooters too. 2 year olds on the smaller side. Petite children will probably do better with the lighter mini micro scooter and the lower handlebar height. This is a great option for those on a budget and for stronger and heavier preschoolers in particular. Even though the handlebar height isn't as low as the Mini micro deluxe, it still goes pretty low and will accommodate most children.